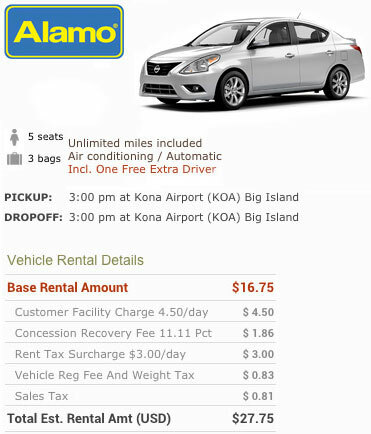 At Cheap Kona Car Rental, we cater to the Hawai'i-bound visitor who wants to spend money on the adventure, not the necessary transportation to get there. Why pay more to sit in our competition's vehicle when you can rent that same ride from us for a discounted price? Our reasonable rates and our leading-brand automobiles are the best you can find on the Internet. We never ask for personal credit information. Simply fill out our no-hassle, no-obligation form to receive your guaranteed quote and reservation. You won't need to pull out your credit card until you are in Hawai'i at the rental reservation desk. All financial obligations are met at the time you return your car to the rental agency. If you should change your plans, we appreciate a brief email letting us know that, however you are under no obligation to do so. (there are never penalties for cancellation with us) Your email simply frees up the vehicle so that another budget-conscious vacationer can take advantage of our low rates. We recommend you reserve early to receive our best rate and the vehicle you want to drive during your stay on The Big Island. No obligation. No payment info up front. Reserve today. This is an example rate. Rental rates can change at any time.